This entry was posted in Curvier, How Does It Fit? and tagged Curvy Fashion, fatshion, Mycra Pac Raincoat, plus size 28, plus size clothing, plus sized 4X, size 26, size 28 by affatshionista. Bookmark the permalink. Oh my gosh, THANK YOU for posting this! I had one of these (the long, black-on-black flocked scroll version) for years. I had waited over two years to order it from the Victorian Trading Catalog, and I hadn’t regretted a penny of the purchase, ever. Then I LOST it (left it on a plane) a year and half ago. I’ve been mourning it ever since. Being in the Bay Area, I now know I can go look in Oakland, and in Moraga, as well as on eBay (which does not have any in a good size for me right now — either 1X or 2X) Thank you, thank you, thank you!! My pleasure, thanks so much for commenting. Please note my comment about wearing their XL even though I am a size 26-28. It is excellent to know that you’ve had no problems with the XL, at a size 26-28. 🙂 That helps me to feel more confident that if I can find one, it will fit me. So far, on ebay I’m seeing mostly sizes S/M and M/L, which I think are their “size 1 and size 2.” Yes, I had a size “1X” before, and it did still fit me, though closely. I *think* that the XL = 1X = size 3 = size 18-20, or maybe 16-18?, supposedly (with 2X = size 4 = size 22-24), according to the sizing I have found various places.They seem to have changed the design somewhat, however, since the one I bought in 2004 or so. They now have 2 buttons (hooray!) 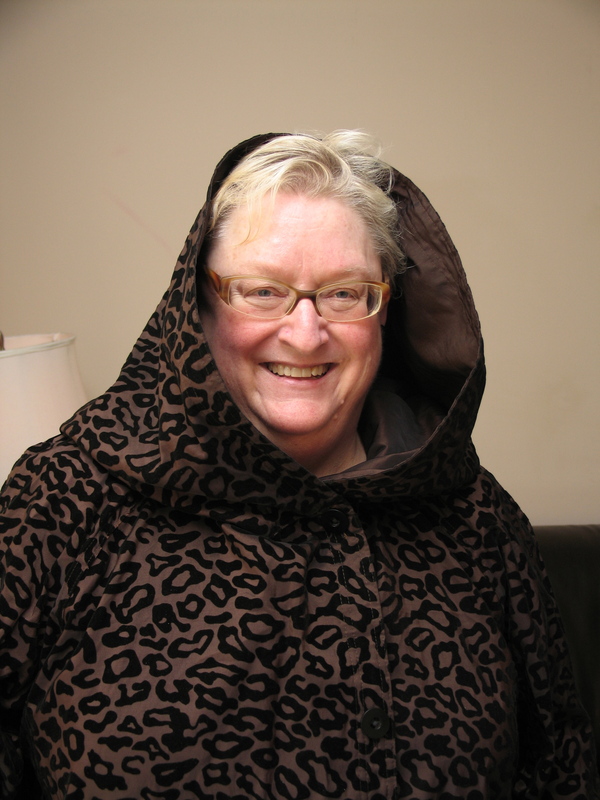 and no sash (I lost mine, because it wasn’t attached), and the hood is pleated, where it was not before. The pics I’m seeing of the current design seem more “straight up and down” than the flowing A-line I had. I’m hoping that’s just how they’re being shown, and the fact that there is no belt anymore. I have a fairly large bust, and my sense was that it was getting a bit snugger there than I might have preferred, at least if I did want to layer it over sweaters or other warm wear, for instance. But the button may help to deal with that issue anyway. Thanks for the post and the reminder about sizing. I think I’ll be taking a trip out to Moraga soon. or at least into Oakland to try on the current styles!